Aerospace technology meets British craftsmanship! The Audio Visual Speaker System from Stands Unique is an original and exciting 'lifestyle' product using the latest high-tech drivers. A true multi-room speaker that enhances any room from a modern designed home to a traditional Victorian property. "There is much more to these speakers than looks alone", "Visually stunning, it's a refreshing alternative to the more lacklustre sub/sat systems traditionally available, the nifty Reflection supports add £350.00 but are well worth the price." AVOne five set + Fathom Sub - Home Cinema Choice August 2002 Best Buy. Product Range Overview - A range of three Unique high performance Loudspeakers AV One, Klarity and Kara, designed to visually enhance your living environment and blend in with Stands Unique furniture. Quality manufactured using only the best top quality components, Kevlar composite cone and a stressed low resonance chassis with unique gold phase plug for the main driver. The soft dome tweeter uses a high efficiency Neodymium magnet system that delivers a fast and accurate transient response, a must for those highs. A well finished pre-stressed steel shroud is built around a beautifully sculptured 30mm thick solid ash hardwood baffle, designed for optimum dispersion characteristics and looks. This makes for a detailed, low colouration, open sounding speaker. Fully magnetically shielded and screened for optimum AV and music listening purposes. More importantly, the speakers are all hand built at our premisis in Rushden, with the care and experience of over nine years, only the best custom made components are used throughout the speaker range. Versatile multi-purpose speakers. centre speakers, main speakers and/or as highest quality rear effects for your AV/Hi-Fi system. The AV One and Klarity are designed to be used both freestanding in portrait fashion or lying down in landscape format. The speakers are supplied with their own combined adjustable foot and wall bracket. An optional pair of fully adjustable wall brackets is available to gain even more flexibility. The wall bracket accessory allows the speaker to be placed directly in a corner (although not recommended for pure sonic reasons) or against a straight wall with adjustment for tilt in all directions. The AV One's shallow profile, only 110mm, allows discrete positioning, this makes them ideal to partner the latest generation of super flat on-wall televisions. Attractive surround sound loudspeakers that are totally unique, with great aesthetics and style to match, they are a superb addition to any AV set up. These speakers will also compliment any of the highly praised Stands Unique hardwood furniture range and are designed to conveniently fit within them. A superb integration of furniture and technology. 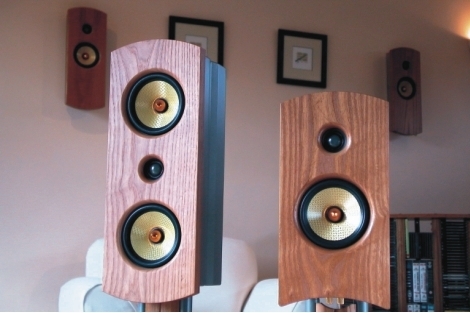 Speakers are available in five solid ash hardwood finishes; natural ash, natural cherry, mahogany, walnut or black ash matching with Stands Unique furniture.